When Rubens painted the life of Achilles, the River Styx is where he began. Bats fly across the sky of that painting and the dead ride a ferry in the distance. Achilles dangles from his mother’s hand by one plump leg, with his head and shoulders entirely underwater. This is clearly no ordinary bath. The three-headed hound who guards the underworld lies curled at the base of the painting where the baby’s body meets the river, as if the baby is being plunged into the beast. Conferring immunity, the painting suggests, is a perilous task. To prepare her children for the hazards of life, my own mother read Grimms’ fairy tales aloud to us every night before bed. I do not remember the brutality for which those tales are famous as vividly as I remember their magic—the golden pears growing in the castle garden, the boy no bigger than a thumb, the twelve brothers who became twelve swans. But it did not escape my notice, as a child, that the parents in those tales have a maddening habit of getting tricked into making bad gambles with their children’s lives. In one story, a man agrees to trade with the devil whatever is standing beyond his mill. He thinks he is giving away his apple tree, but to his dismay he finds his daughter standing beyond the mill. In another story, a woman who has been longing for a child becomes pregnant and craves a plant called Rapunzel that grows in the garden of a wicked enchantress. The woman sends her husband to steal the plant and when he is caught, he promises their future child to the enchantress, who locks the girl away in a tall tower with no door. But maidens locked in towers will let down their hair. And so it was in the Greek myths my mother read to me later. A king who had heard an ominous prophecy could not keep his daughter childless by locking her in a tower. Zeus visited her in the form of a shower of gold that left her pregnant with a child who later killed the king. When the infant Oedipus, left on a mountainside to die, was saved by a shepherd, he was not saved from the prophecy that foretold he would kill his father and marry his mother. And Thetis, Achilles’s mother, could neither burn nor drown his mortality. A child cannot be kept from his fate, though this does not stop the gods themselves from trying. Achilles’s mother, a goddess who married a mortal, heard a prophecy that her son would die young. She made every effort to defy this prophecy, including dressing Achilles as a girl during the Trojan War. After he took up a sword and was discovered to be a boy, his mother asked the god of fire to make a shield for him. This shield was emblazoned with the sun and moon, the earth and ocean, cities at war and peace, fields plowed and reaped—the universe, with all its dualities, was Achilles’s shield. The story my father told me when I was young was not the myth of Achilles, he reminds me now, but another ancient story. As my father relates the plot, I understand why I confused the two. The hero of this story is made immune to injury by bathing in the blood of a dragon. But a leaf clings to his body while he bathes, leaving a small spot on his back where he is unprotected. After having been victorious in many battles, he is killed by one blow to that spot. Immunity is a myth, these stories suggest, and no mortal can ever be made invulnerable. The truth of this was much easier for me to grasp before I became a mother. My son’s birth brought with it an exaggerated sense of both my own power and my own powerlessness. I found myself bargaining with fate so frequently that my husband and I made a game of it, asking each other what disease we would give our child for prevention against another—a parody of the impossible decisions of parenthood. When my son was an infant, I would hear many variations of “All that matters is that he is safe.” I would wonder whether that was, indeed, all that mattered nearly as often as I would wonder if I could keep him safe. I was certain that I did not have the power to protect him from his fate, whatever it might be. But I was determined nonetheless to avoid the bad gambles of the Grimms’ tales. I would not let my child be cursed by my own carelessness or cupidity. I would not accidentally say to the devil, You may have what is beyond the mill, only to discover that what is standing beyond the mill is my child. 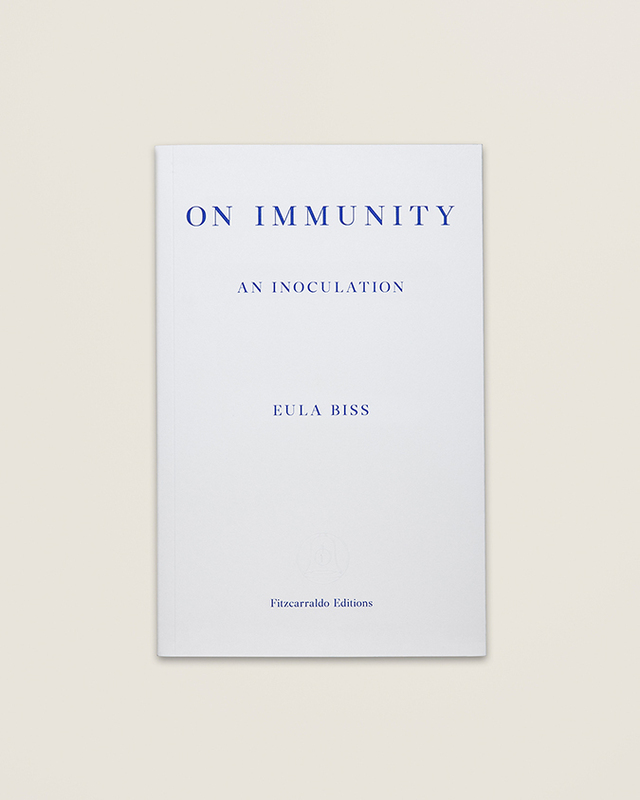 In this bold, fascinating book, Eula Biss addresses a chronic condition of fear – fear of the government, the medical establishment, and what may be in your children’s air, food, mattresses, medicines, and vaccines. Reflecting on her own experience as a new mother, Biss investigates the metaphors and myths surrounding our conception of immunity and its implications for the individual and the social body. She extends a conversation with other mothers to meditations on Voltaire’s Candide, Bram Stoker’s Dracula, Rachel Carson’s Silent Spring, Susan Sontag’s AIDS and Its Metaphors, and beyond. On Immunity is an inoculation against our fear and a moving account of how we are all interconnected – our bodies and our fates.